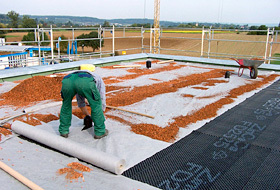 Example of a typical green-roof build-up with drainage element, filter sheet and substrate layer. 25 mm Floradrain® Elements FD 25-E are being covered with system filter sheets. Due to their special surface structure these drainage elements interlock well with the substrate layer and can be used for pitched roofs with slopes up to 25°. When vegetating roof surfaces, it has to be considered that they form extreme locations for plants. Strong sun radiation, impact of wind and frost as well as limited root zones caused by relatively thin layers require plants, which are robust, frugal and drought-resistant. Even if such species are chosen, there is a certain risk that they will not survive on the roof in the long run. For one more factorhas to be taken into account: Plants don’t like wet feet, at least not for a longer period of time. Therefore, when planning and installing green roofs, it is essential to cater for a perfectly working drainage. Basically, this fact is well-known: every flower pot has got a hole in its bottom where excess water can drain off. And when in the 1920s the quality of reinforced concrete and asphalte had been greatly improved it enabled the installation of more and more roof gardens. Asphalte-coated concrete roofs were covered with a drainage of chippings or gravel, filled up with soil and planted with lawn, flowers and even trees. This construction method has hardly changed until the 1970s. Except for the decks of underground parkings, most recent roofs are not designed to carry these loads. So, in the meantime a great number of lightweight alternatives have been developed, replacing the former heavy chippings or gravel drainages. Particularly area-wide installed drainage elements of profiled plastic or foam material, covered with filter sheets have found their market, as they can carry additional functions for the benefit of vegetation, roof and building. 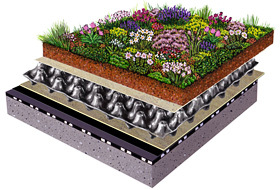 However, not all drainage elements are the same: The green roof system manufacturer ZinCo offers 15 different types of drainage elements – for good reasons! Different roof situations and different requirements concerning the plant level often require special solutions. The amount of exceeding water to be discharged, which depends among others on the local rainfall, the storage capacity of the substrate layer and from the surface to be discharged. It also has to be considered that alongside adjacent facades increased driving rain may be expected. 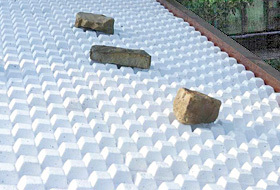 The slope situation – a roof with a ponding tendency needs a drainage layer high enough to prevent the contact between the filter sheet and standing water. Otherwise the filter sheet would form a wick, soaking up the water. The expected load – when green roofs are supposed to support trees, or if traffic spaces such as fire lanes shall be provided, stronger elements are required than for thin build-ups with a weight lower than that of a gravel surface. Additional functions that have to be adhered to, such as: mechanical protection of the waterproofing, suitability as a water supply for dam-up irrigation of roof gardens, shear bearing on pitched roofs or as additional thermal insulation.